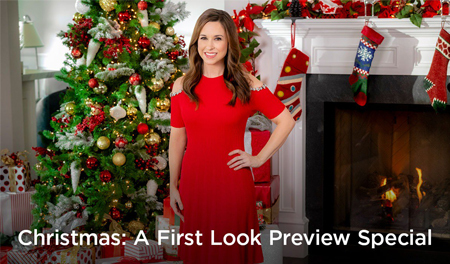 On Saturday, July 21st, actress Lacey Chabert ("The Sweetest Christmas") hosted "Christmas: A First Look Preview Special" on the Hallmark Channel. In the opening segment Lacey shares these sweet sentiments... "I have to tell you," Lacey says, "Christmas is my most absolute favorite time of year, probably explains why I do so many Christmas movies... because I just love Christmas! It's just never too early to start connecting with loved ones, planning those magical nights trimming the tree, sipping hot cocoa by the fire, my favorite!, or just snuggling up to watch your favorite Holiday movies." ❄Christmas Joy - Lacey introduces the first movie with, "When I think of Christmas, the first thing that comes to mind is gingerbread, both the spicy scent of gingerbread filling the air, and if you're feeling really festive, attempting to build a gingerbread house. I can speak from experience that the latter is not always pretty. Our first movie Christmas Joy starring Danielle Panabaker and Matt Long is the ultimate combination of cookies, gingerbread houses, a pretty intense competition, and a recipe for romance." 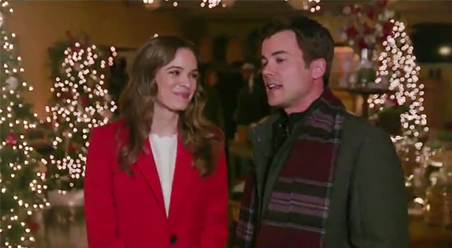 Video clips are shown in the preview special of "Christmas Joy," and Danielle Panabaker and Matt Long give a behind the scenes look of their movie. *Christmas Joy is currently scheduled to premiere October 27, 2018! ❄Christmas at Graceland - "In the next movie," Lacey Chabert shares, "an ambitious business executive named Laurel, played by country star Kellie Pickler, travels back to Memphis to acquire one of the cities oldest family owned banks." Video clips are shown in the preview special of "Christmas at Graceland," starring Kellie Pickler and Wes Brown ("Christmas Cookies"). *Christmas at Graceland is currently scheduled to premiere November 17, 2018. ❄Christmas Recipe for Love - "I always know it's Christmas," Lacey shares, "when I first smell delicious cookies baking in the oven. There's a lot of love that goes into them. And speaking of cookies, this next story is all about Carlingson Bakery, the original home of the famous Kringle Christmas Pastry. Allie and her father work at the bakery, which is the heart and soul of their small town." A video clip is shown in the preview special of "Christmas Recipe for Love," starring Brooke D'Orsay ("Miss Christmas") and Daniel Lissing ("A December Bride"). *Christmas Recipe for Love is currently scheduled to premiere November 11, 2018. ❄Christmas at Pemberley Manor - "When I think of Christmas," Lacey shares, "one of my fondest memories is reading The Night Before Christmas and now I get to do that with my little girl, Julia, and it's just magical. I also think of last minute wrapping, kisses goodnight, the anticipation of Santa, and it just may be the best time to make a Christmas wish for love. In this movie when Elizabeth puts together a Christmas festival at Pemberley Manor with the all business William Darcy, things get off to a rocky start for the pair. But as time passes, Mr. Darcy slowly softens." Video clips are shown in the preview special of "Christmas at Pemberley Manor," starring Jessica Lowndes ("Magical Christmas Ornaments") and Michael Rady ("A Joyous Christmas"). Plus, Michael and Jessica give a behind the scenes look of their movie. *Christmas at Pemberley Manor is currently scheduled to premiere November 3, 2018. ❄It's Christmas, Eve - Lacey continues to share, the "Holidays are the perfect time to sit back and snuggle up with a good romantic movie... This next Christmas movie features country star LeAnn Rimes and Tyler Hynes. Eve is an interim school superintendent that lost her love of music after her father passed away. She's been tasked with managing the budget for the school, recommending they cut the arts program across the district. Music teacher Liam sets out to change Eve's mind." Video clips are shown in the preview special of "It's Christmas, Eve," starring LeAnn Rimes and Tyler Hynes. Plus, LeAnn and Tyler give a behind the scenes look of their movie. *It's Christmas, Eve is currently scheduled to premiere November 10, 2018. ❄Marrying Father Christmas - "I have one more movie I'd love to share with you," Lacey says. "Starring Hallmark Channel favorites Erin Krakow, Niall Matter, and Wendie Malick, "Marrying Father Christmas" is the third installment of the beloved Father Christmas franchise that will air on Hallmark Movies & Mysteries this Holiday Season. Miranda is relocated to the Northeast as she splits her time between Boston, where her business is located, and Carlton Heath, a picturesque small Vermont town, where her fiancé Ian lives. As we know, it's not easy being away from the one you love. Video clips are shown in the preview special of "Marrying Father Christmas," starring Erin Krakow, Niall Matter, and Wendie Malick. Plus, Erin, Niall, and Wendie give a behind the scenes look of their movie. *Marrying Father Christmas is currently scheduled to premiere November 4, 2018 on Hallmark Movies & Mysteries. *Premiere dates were given during the preview special, but please know, there's always a possibility that they may change as we get closer to the season! Be sure to stay tuned for any updates. From now until July 25th - you can watch this entire Christmas: A First Look Preview Special on Hallmark Channel's web-site - *HERE*! Hope you enjoyed this Christmas Preview recap! Net- I thought the Christmas preview show had a few surprises. Thanks for updating. I get a bit overwhelmed each year by all the new stuff, but your schedule and reminders keep me sane through the rush of the holidays. Don't know what I do without you and my daily fix of It's a Wonderful Movie and that's the honest truth. Oh, Brooke... I'm so glad I can be here to help you throughout the holidays and hopefully relieve some of the pressure of trying to catch your favorites and watch everything! I know it can be quite a task to navigate through all the schedules. I keep my Christmas TV Schedule print out near my TV or remote and it's always there as a reminder when to record the next new movie! I'm honored that my site means so much to you... thank you so much for sharing that with me. That's a great idea, Dee! I love having all my listings organized too! And I have the exact same problem on deciding what to watch/record when new shows are on at the same time! Having to choose can sometimes be a difficult choice... not only between the Hallmark Channel and Hallmark Movies & Mysteries, but also Lifetime, UP, INSP, and ION! Had no idea we could watch this online. Thanks for the tip, Net...going to watch it right now! Enjoy! It says you might not be able to fast forward, but I did the commercials and it worked just fine for me. When I saw on other site was saying Christmas Joy will premiere on October 28, 2018? This site says Christmas Joy will premiere on October 27, 2018; it's Friday. Which these correction dates will premiere of Christmas Joy? You have me confused the premiere date of Christmas Joy!!! According to the "Christmas: A First Look Preview Special" hosted by Lacey Chabert, "Christmas Joy" is supposed to premiere Saturday October 27, 2018 at 8pm/7c. Hallmark has also shared this date. However, times are subject to change... so I wouldn't be surprised if this happens. Please keep a watch here for any additional updates or additions. Are there any new Christmas movies for weekends until January 2? Oh yes, the Christmas Season on the Hallmark Channel runs from October 26 to presumably around New Years Day... and will be filled with Christmas movies every weekend, Saturdays and Sundays! I'll be sharing here as Hallmark releases any news. Oh what fun it was to watch the preview show and to see what is coming up for Christmas! I loved the preview show. Kind of made me feel emotional though knowing a wonderful full month of Christmas in July is almost over. So hard to believe a full month has passed already and also knowing we have to wait three months to see these new movies (although I do know that time will pass like the blink of an eye). Usually when we see the Preview show we are only a week away from it starting. So it was a mix for me. I loved it but it made me kind of sad at the same time. Jim, it is hard to believe how fast this time has gone by. Christmas in July is such a wonderful treat in the middle of summer! I am so going to miss knowing it's there to watch 24-7 on either of the Hallmark channels. I'm sure there will be many wishing for a Hallmark Christmas channel once again. Myself included! So true Net. It is always such a great feeling to know that 24-7 you can turn your TV on and get that Christmas Hallmark warm feeling. Even if it's 4am and you can't sleep. It's there to comfort us. Months ago in a comment I mentioned that I am surprised nobody has created a 24/7 Christmas channel all year long. There's a channel for everything else. I love the idea of having a 365 24/7 Hallmark Christmas Channel. Although maybe we would get saturated with it all year and it would ruin the special feelings we get at Christmas time and Christmas in July. Although it is not Hallmark that gives us that magical feeling at Christmas...it's the season of Christ's light that does that. Hallmark is just one bulb among many lights. That is a beautiful way to put it, Jim... so eloquently written! I wholeheartedly agree... it is, indeed, as you said, "the season of Christ's light" that fills our hearts with the greatest joy! Jim/Net, you just filled my heart with joy....so beautifully depicted and expected from two of Our Lord's loving stewards! Just wonderful! !